Chilly's Gift by Michelle Lutzen of Stitchy Kitty. Stitched on 14 count baby blue aida using the DMC recommended. I used a pink tree, pink ribbon and star to embellish it. Despite the photo, they are identical in size. These are Christmas gifts for two little sisters. I used an Aussie hand-dyed opalescent Lugana 28, Spice Blend Peacock Fantasy by Stiches and Spice, Crescent Colours and DMC floss, Mill Hill beads. 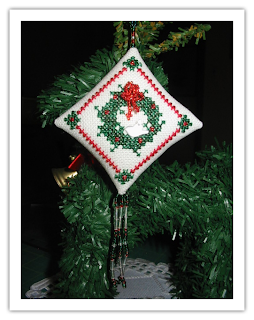 The angel design is from Graphworks Mini Motif Designs for Christmas Vol III (1983). Winterbird Wreath Kit by Mill Hill. I came across this UFO from last year and decided it needed to be finished. My first time stitching with beads. Stitched on 28 count with DMC Threads and Mill Hill Beads. Stitched by Sue in Australia. 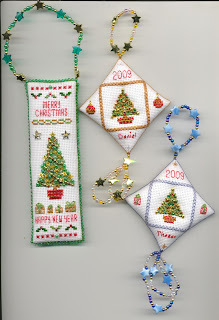 These are the final 2 diamond-puff ornaments for a family of four children and their young cousin, and a door-hanger ornament I stitched to use up the odd-shaped scraps of Aida left after stitching the diamond puffs. This is my April Ornament, a christmas Elf. I found the pattern in the "Cross stitch crazy" magazin, and I wanted to try it. It is on Plastic Canvas, so the Arms and legs are stitched separatly. 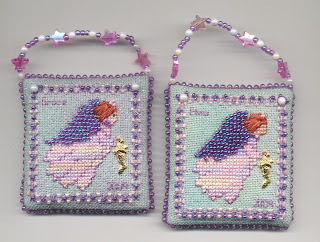 It is hold together with the seedbead, which I sewn on it. Sorry that the lighting is so bad in these photos! The colours are way off because it is a very grey and rainy day here, but I was so excited to get this project of mine done that I could not wait to photograph them! The ornaments are double sided. They are stitched on 14 count Aida. I can not remember the exact name for this particular Aida, but it has silver strands woven into it which give the ornaments a snowy effect. The threads are from my miscellaneous box. Using my leftover threads was kind of fun because no two designs are stitched in exactly the same colours.